Coming Soon w/ ADMIN Created by Junusme. This templates have specific characteristics, namely: Coming has features such as High Resolution: Yes, Compatible Browsers: IE10, IE11, Firefox, Safari, Opera, Chrome, Edge, Software Version: PHP 7.x, PHP 5.x, PHP 5.0 – 5.2, PHP 5.4, PHP 5.5, PHP 5.6, MySQL 4.x, MySQL 5.x . You can use this Coming Soon w/ ADMIN on Php scripts category for admin, admin panel, bootstrap, codeigniter, coming soon, custom, database, login, modern, mysql, php, phpmyadmin, responsive, simple, under construction and another uses. We are happy to announce that we will sell this this theme with a 20% discount to the 50 first buyers! Don’t miss out on this theme. Get your own copy of the theme today! ComeCome is the new responsive, modern, featurefull coming soon, including a powerfull admin panel.With this theme there are no need for coding knowledge. 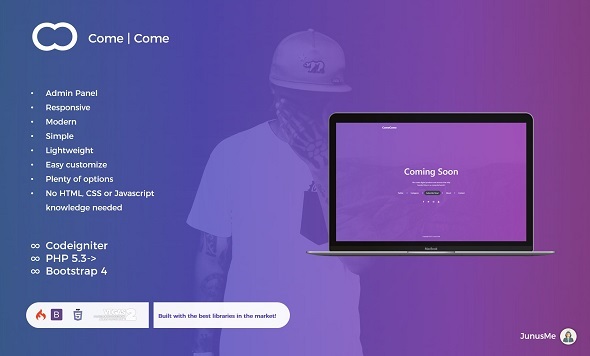 Just download and you are ready to go.ComeCome is built for everyone who don’t know how to code, or just want to set up a coming soon page quick without to much work. Check out the theme w/admin panel yourself! DISCLAIMER: Images used in preview theme are not included in the endproduct.